In 2001, Wayne and I discovered our float cabin on Powell Lake in Coastal BC. In the beginning, we could only be there on school holidays since we were both educators. Now we can be in our off-the-grid cabin home about 75% of the year in all seasons. Coastal communities are linked primarily by the ocean, rivers, and lakes. In the water world, floating cabins were traditionally used for logging and fishing camps. 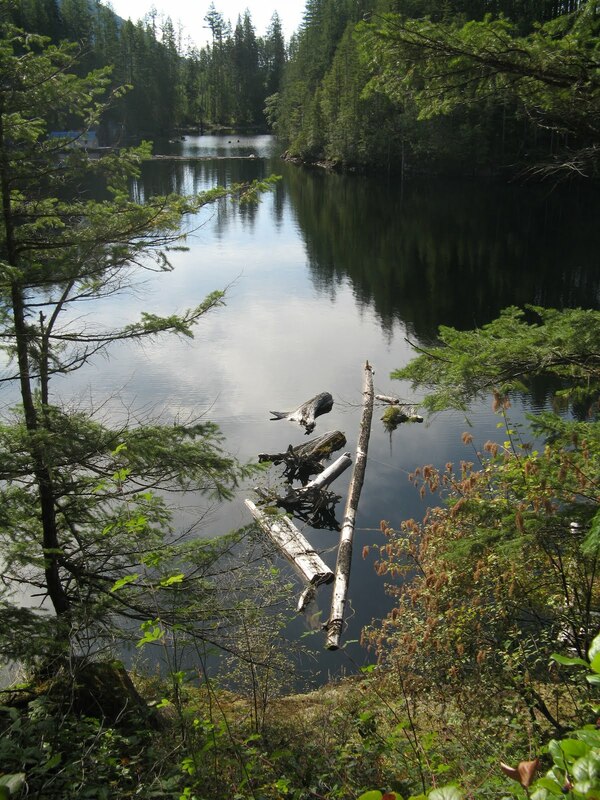 Today on Powell Lake, they are recreational getaways for locals and visitors from around the world. Our cabin is built on a 40X40 foot cedar log float. The cabin is 675 square feet including a great room for our kitchen and living area, guest bedroom, storage room, bathroom, and a large loft bedroom. We use solar, wind and thermoelectic power augmented with a gas generator in winter. Our stove, refrigerator, and lights use propane. 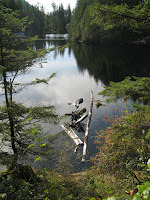 Our wood stove provides heat, we get our water directly from the lake, and our toilet uses composting technology. It's a simple living arrangement that brings us a lot of pleasure. Here in Canada there's a movement called Idle No More. This movement is about standing together to save the environment, preserving First Nations cultures, and respect for all. Many people in my hometown of Powell River care deeply about the environment. On January 11, members of Tla’amin (Sliammon) First Nation joined a Canada-wide demonstration in support of Idle No More. A girl from Tla'amin named Ta'Kaiya Blaney spoke and sang at the gathering with a powerful message for all of us. Click the arrow to hear it for yourself. This video by Damien B is also available on YouTube. Thank you Damien for giving me permission to share it with you here on my blog. This isn't my normal kind of Monday cooking post. 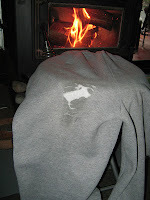 But back up too close to a wood stove, and you just might "cook" your buns, literally. You can see that I did just that to a pair of sweat pants. The synthetic fabric first melts, then becomes brittle. A hole in a critical spot in the cold country can make for quite a draft in unwelcome places. So, after a few wearings of my holey sweats I got out my trusty needle and thread, and a piece of flannel sheet fabric from my sewing drawer. First I stitched the melted edges back together. Then I sewed a flannel patch on the inside to keep the rough edges of the melted pant leg away from my skin. Then I repeated the process with another patch on the outside to hold the hole together during washing and wearing. Now I can back up to the wood stove and warm my buns without burning. That's what I call a recipe for success. Because our cabin floats, it moves back and forth, and up and down with the lake. Steel cables anchor us in place, and log booms provides a floating barrier to protect us from wind waves and wakes. We augment the boom in front with stumps. They are decorative and the deep roots help settle rough water. Sometimes the lake decides to take our stumps back. A few weeks ago, we had strong winds. The next morning I saw that Stumpy was missing. I looked out and saw him floating towards the narrows. After it calmed, we tried to retrieve our wayward stump, but couldn't get him to tow straight. After several tries, we decided to say goodbye to Stumpy. I know it's still January and the heart of winter, but my mind keeps jumping ahead to spring. Bunny has been with me since 2003, the first year of my floating garden. In 2010, he got a facelift and had reconstructive back surgery so he could continue with his garden protection duties. He's actually a movie star bunny. Recently he was seen on duty in Hole in the Wall on the travel channel. Right now there's only a few hopeful Grape Hyacinths ready for some warm weather to go with the moist rains. It's been such a mild winter. The last time we were up at the cabin, we only got just a dusting of snow. Even Goat Island didn't have much to show. On the other hand, we didn't have to shovel or sweep any off the roof. This year we decided to leave our ocean boat named Foghorn on the hard during the winter months we won't be using her. She's up at Valley Marine where Jeff did her annual inspection and winterization. You can see her in the background on the left up on blocks. In front is a skookum (strong) ocean going tin boat, a big brother to our little 14' model. Her name is Pacific Paragon. Paragon means "a person or thing regarded as a perfect example of a particular quality" or "a person or thing viewed as a model of excellence." If you've ever used a tin boat, paragon in an excellent choice for a name. I'm not sure how she made her way to this boat yard in Powell River. Her transom sports the home port of Secret Cove, BC. 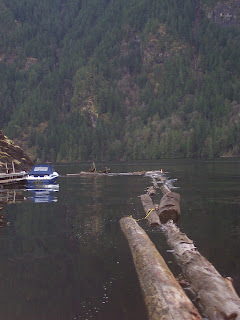 Booms of logs protect our floating cabin on Powell Lake. The log booms cut the wave action from passing boats and wind generated waves. Powell Lake is large and deep, so substantial waves can build during heavy winds. Fortunately, we are protected in the Hole in the Wall, but not completely. We have log booms along the front and side of our water lease area. A 30 metre (100 foot) rock wall serves as protection on our shore side. 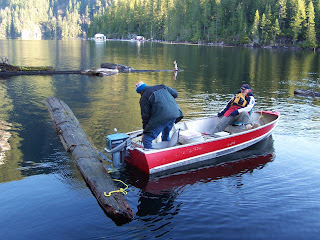 Our boom is constructed from logs that have been floating in the lake for years. They are anchored to shore and the lake bottom to hold them in place. Sometimes the connections need fixing. Here's our good friend John helping us move a log back into place. The sturdiest connection between logs is called a boom chain. They are the chains used by loggers to hold together the large booms of logs pulled to market by tugs. This January we've had some clear weather, and that brings freezing temperatures. Heading out on a frosty morning you can find lots of evidence of the nightime chill. Glass, metal, plants, everything sports a mantle of white and crystals. I used my Fannie Farmer Cookbook, some frozen strawberries (the last from my own plants), and a can of sliced peaches to make an easy dessert for dinner up at the cabin. Living half an hour up the lake by boat, I try to keep plenty of staples on hand for just such an occasion. I thawed one cup of strawberries and found a small can of sliced peaches in the pantry. Coat a 9-inch cake pan with cooking spray. Then mix strawberries, drained peaches, 1 teaspoon flour (for thickening), and 2 tablespoons sugar right in the pan. So easy! In a small bowl, mix together the first six ingredients. Using a pastry knife or fork, cut the margarine into the dry ingredients until it's crumbly. Sprinkle the oatmeal crumble mixture over the top of the fruit. If you like a heavy topping, you can use it all. But we are trying to be somewhat good. So even though this is a small recipe, I was able to save half of it for another dessert. I bagged and labeled the prepared crumble topping. Now I have it ready in the freezer for an even easier dessert another evening. Bake at 350 degrees for thirty minutes, or until bubbly and browned on top. This is where my new propane stove comes into action It's so much easier to cook now that I have an oven that holds the correct temperature. 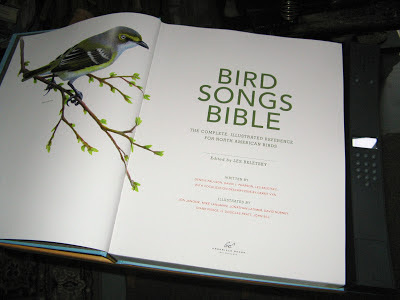 For Christmas, Wayne got me a wonderful new book. Up at the cabin, I love to have nature guides to help me identify the plants and critters we encounter. With no Internet, it's nice to have books with lots of pictures and descriptions. The Bird Songs Bible fills that bill, plus it has an audio feature with bird songs. Wayne found it on the bargain books shelf at Barnes and Noble in Bellingham. 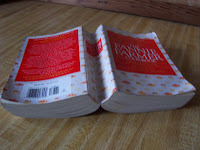 The original price was $125.00 and I can see why. It has quality paper with full colour images. However, I probably would have passed it up even with the audio bird song feature at that price. But at $24.95, it was a steal and a perfect addition to our cabin library. Keep your eyes open at book store bargain tables or online. Maybe you can find one for yourself. Sunrise at our float cabin up Powell Lake. What a gorgeous day. When short winter days, and cloudy doldrums hit, times like this are cherished. The shadow of Goat Island crosses over our cabin at about 9:45 a.m. Looking north up Powell Lake towards the head. A neighbour's cabin is on the left. Heading south on an early morning cruise over glassy waters. Before I discovered Powell River, I was a horse woman. 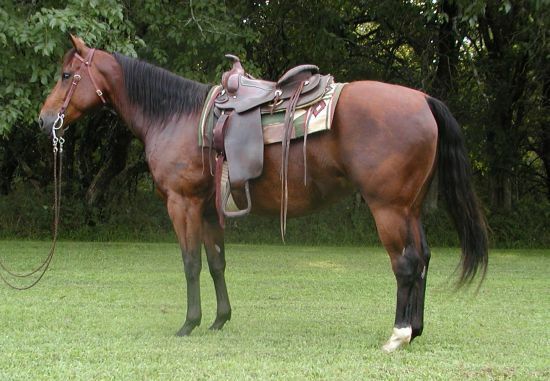 As a kid I saved my allowance to rent a horse for an hour a week. I pestered my parents until I got Misty in junior high. I lived in Compton, California, so having a horse meant boarding it along the Los Angeles River. In the early years, the Los Angeles River was natural with sand, willows and Horned Toads. By the time I got my first horse Misty, it was a cement channel with trails along the side. Next came Burke, then another Misty, followed by Cowboy. 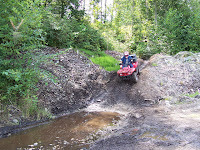 Soon after Wayne and I bought our float cabin on Powell Lake, our good friend John introduced us to off-road riding. My first try was a Honda 100 off-road motorcycle. I had one riding lesson at the gravel pit and it was clear, bike riding wasn't for me. John suggested a quad (easier to stay upright) with an automatic transmission. So I purchased a Honda Fourtrax TRX250 ES. It was love at first sight. 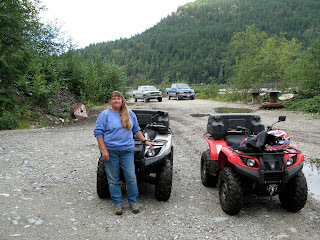 I used that 2-wheel drive quad for several years, and it kept me going almost everywhere with the "big guys." Flying this time of year gives you hazy views of nearby Bellingham Bay. Even with a cloud cover and light mist, a hazy sun shines through. 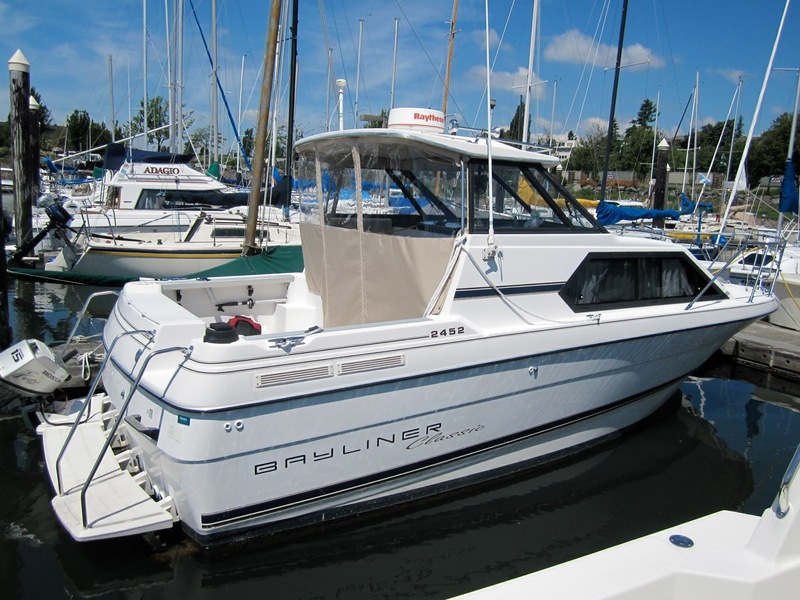 It's winter and our 2452 Bayliner in Bellingham has been out of the water for her annual maintenance. She's now back afloat with some creatively named neighbours. However, our boat has no name. We bought her that way and haven't gotten around to christening her with an official moniker. But name, or no name, she's my favourite boat. I love her spacious interior (compared to our 23' model) and the raised bridge for good viewing. 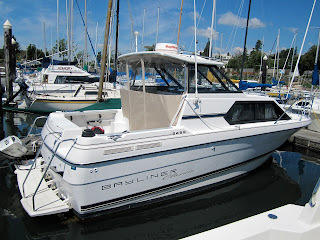 I love the way she takes rougher water, and we've added an enclosure to make it warmer to boat in the winter. What's not to love.